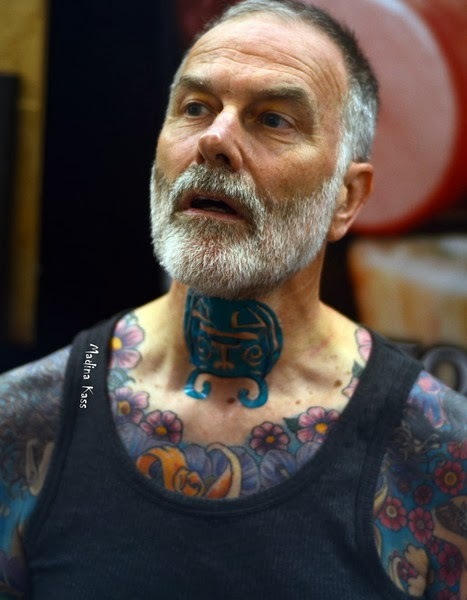 I have previously posted my temporary face and neck tattoos I had done earlier in the year at Cheltenham. Here is the process in full as Rizpah Brinkman piece by piece attaches the templates and then air sprays my skin. It was an exercise that took almost an hour to complete. You can see the concentration on Rizpah's face. The work on my right leg is not yet complete and it's been a disappointment that it is impossible to see the whole painting. So the other day I persuaded Drew Cox, www.drewcox.co.ukwho is a professional photographer to take a number of shots around my leg to give a better idea of what is going on. It is still not possible to join everything accurately but I thought the above image looked interesting. Caroline has many ambitions. She currently lives in Berlin where she is studying alternative technology. It's all part of her Earth Sciences degree where she is working on satellite imagery and hopes eventually to work in marine biology and technology. She is 23. Her tattoos mean she will never again be totally naked. Her tattoos depict her personality, she says. They are her way of life. She is able to take long sessions at a time and her new piece on her left leg is shown above, minutes after completion. Her parents don't like her being tattooed and think no one would marry her because of that. In spite of that, she was accompanied by her boyfriend. She loves heavy metal. A native of Belfast, Northern Ireland, she says she is not making great progress with her German while living in Berlin. I love getting my face painted and when better than Halloween. My arrangements for a temporary tattoo on my face and neck early in the day had fallen through so in the evening in Cardiff I spotted that one tattoo team all had ghoulish painted faces. So I said please can I have one too and this is the result. The work was done by a tattooist and I can't remember her name but she did a great job. The whites of my eyes against the black look scary. After everything shut up at the convention I went to the hotel where the Halloween party was to take place, looking as you see here. Then I rechecked my train times back to Bristol and discovered the last train went early so I had to leave immediately. Infuriating because my face paint never enjoyed the exposure I wanted it to have. And here is someone who probably did make it to the party. The skull look is so popular now. Ben is a civil engineer and is partial to church architecture which explains why he chose this design for his backpiece. He's from Plymouth and has his work done at Shady Lady in Falmouth. I spent a lot of time hanging out at their spot at the Cardiff convention. Ben doesn't have much to say for himself so some of my conversation was through his partner of one year. Abi (an appropriate name really) has no tattoos and hopes he won't have any visible tattoos. She herself is very indecisive about having a tattoo. It was when he was working in St Ives in Cornwall that Ben started getting his tattoos in Falmouth. His work has been done over three years. Now he is having his leg done which was about to be finished spreading to just below the knee. Perhaps the most entertaining part of my day at Cardiff's Halloween Bash was with Amy and the team from Shaded Lady in Falmouth. http://shadedlady.co.uk/ Here you can see Amy with Al Williams taking the shortest of breaks while I took this photo. At Shaded Lady it seems that tattooing is just a lot of fun and I spent a good deal of time chatting with Al, Amy and Josie Williams who is not shown here. Unaccountably for an Englishman Al was wearing a kilt, though on second thoughts that could have been a nod in the direction of Halloween. Annoyingly Amy suffers little or no pain whilst being inked, which hardly seems fair. As a result she can take very long sessions. During the convention her sleeve on the left arm was being completed. Her right sleeve was completed in three sessions of four hours a while ago. I had not gone to the Cardiff Halloween Bash this past weekend expecting to have my photo taken with Lauren Brock (professional name Lady Lauren) and with Annalieza (who I featured in my blog a few months ago.) But Lauren's man, Jon, decided he wanted a photo of us together so he took one on his camera and this on mine. Some dreams do come true. Lauren has appeared on the front cover of numerous tattoo magazines and a simple search for her name brings up numerous photos on her, all far more professional than these, but Lauren is such a skilled model that even at my hands she makes my photos look pretty good. She was on the front cover of Skin Deep just eight months ago. As she is a native of Cardiff, it was hardly surprising that I caught up with her at the windswept Millennium Stadium on Saturday. Glamorous women yes, bit the breeze block wall hardly matched them. An outdoor location was not feasible because it was blowing a gale and very cold. Adrian is a big man and of my friends in Bristol the only person who has just about as much ink as I have - maybe more. His legs are covered and there's quite a bit of stuff elsewhere. All of them appear to be influenced by his beliefs. He even had some druid symbols tattooed over his already completed leg piece. I had planned to get more information from him about his tattooist and the sequence of his tattoos but haven't yet done so. That will follow. He and I were at a convention at the Costa Brava earlier this month and it's at the hotel I took these photos. I am one of those people the BBC writes about online, who want more and more ink. As my upper leg piece moves into its final stages the obvious problem emerges. You can't really see what the whole picture looks like unless you join up a series of photos, something I will get done when it is completed. The BBC article is interesting and very fair, quoting psychologists who say apart from being more extrovert they can see no difference in personality between those who get multiple tattoos and those who don't. It's about the aesthetics.